Makeup by the amazingly talented Ericka Acosta (muafxgeek on Instagram). 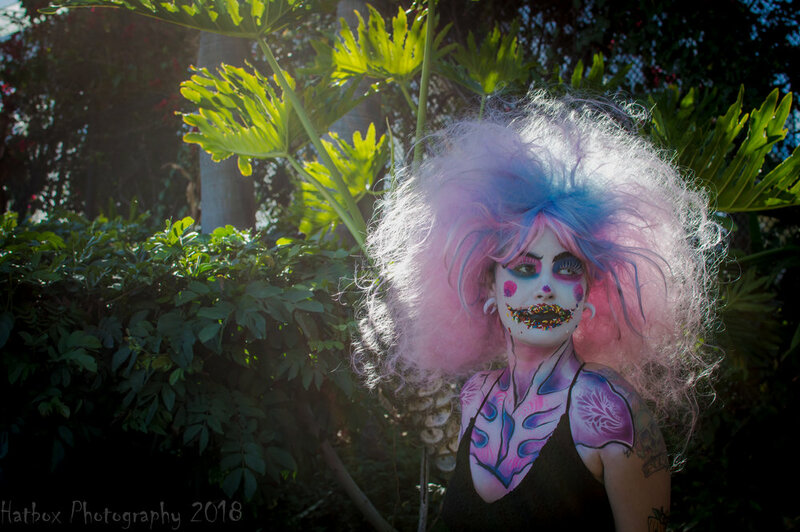 She has done makeup for Knott's Scary Farm and Queen Mary's Dark Harbor. She is also a prop master and body painter. Give her a follow. Our model is Amanduh (atomic_aerial on Instagram). She is smart, funny, talented and studying to become a dental hygienist. This is the story of how Sprinkles came to be. Several years ago a child was born who was slightly different than what you would call a normal child. She was born with pink and blue hair that was soft and airy, just like cotton candy. She also had a permanent smile on her face due to a birth defect that wouldn't allow her lips to relax. Her parents, Roger and Patty Smyth couldn't stand to look at their child. They called her a freak. They were embarrassed by her. Couldn't bring themselves to love her or give her the attention she needed or deserved. One day while the child was still just 4 years old, Patty took her to a circus and left her there behind the tent. She told the child as she set her down, "Now you are where you belong. With the other freaks." Patty walked away without a second glance. Who could do such a thing to such a beautiful child. Sure she was different but she was sweet, innocent, smart and loving. Even with all the abuse she suffered at the hands of her parents, she still had so much love to give. Luckily for her, the circus was where she belonged. At least for the time being. She grew up with the circus. Traveled from city to city, town to town. Seeing so much of the country that a regular child could only dream of seeing. The trapeze artists were her favorite. They were very good to her. She loved to watch them fly like birds through the air. She thought that one day that would be her up there soaring through the sky. One day the trapeze artists were practicing a new trick without a net when one of them slipped and fell 50 feet to the concrete floor below. They survived the fall but they were permanently paralyzed. It was the most tragic thing Sprinkles had ever encountered since she was left at the circus several years before. She didn't know if she had it in her to continue traveling with the circus but what else could she do? She didn't know anything else. The circus raised her. She sat in her trailer contemplating life and where this journey would take her. Could she go off on her own? Would she survive? She decided that she would stay with the circus until she found a new place to call home. Lucky for her that journey was about to come to an end. There is a place in Long Beach, CA right on the bay that is home to a giant tourist attraction. People come from all over the world to witness her beauty. Her name is The Queen Mary. A retired passenger ship that was once used as a troop transport during WWII is now a hotel and floating spectacle that is not to be missed. Long Beach has been its home since 1968 and many have come and visited her in all her glory. Next to the Queen is a giant white dome that once housed the legendary Spruce Goose. There is a courtyard out in front which they use for many different events. A few years ago the circus that Sprinkles was a part of decided to set up for a few weeks in that courtyard. This was going to be a life changing moment for her. As soon as they arrived in Long Beach things changed for Sprinkles. She was home. She had never seen anything so beautiful before. The first time she stepped foot inside the Queen Mary she felt alive again. 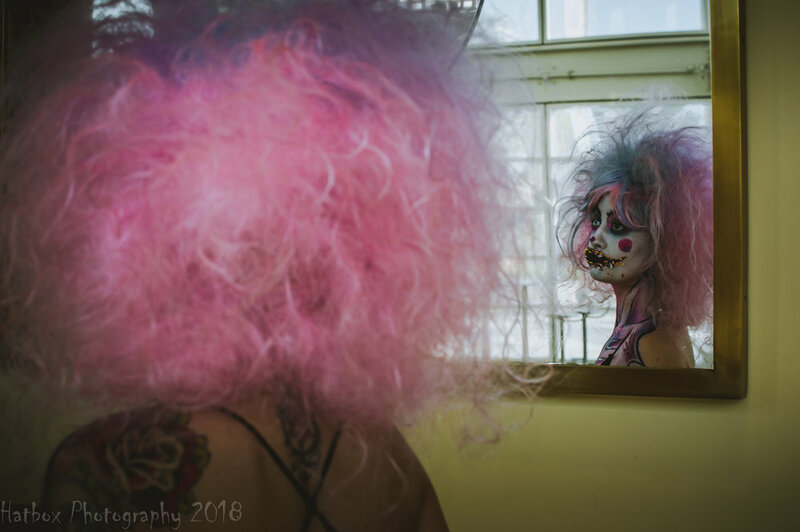 It was a feeling she hadn't felt since her first few years with the circus. So the circus came and went and she stayed behind refusing to continue traveling. Later that same year Sprinkles got word of an event at the Queen Mary called Dark Harbor. Apparently it was some sort of Halloween carnival or event where freaks and clowns get to terrorize people who actually pay to get scared. She thought this was perfect. She went to the audition and killed it. She was hired on the spot. As opening night got closer she became anxious and a little nervous. She was not sure what to expect from this event but her excitement grew with each passing minute. Soon the Captain would give his orders to open the gates and the freaks of Dark Harbor would be unleashed upon the public. This is a night that would change her forever. Never in her wildest dreams could she have imagined feeling this kind of joy and happiness from tormenting men, women and children all night long. By the end of the first night she was exhausted but in the most wonderful way possible. She couldn't wait to do it all over again. Fast forward a few years and Sprinkles is as happy as can be. By day she has found a new passion as a dental hygienist. By night, she continues to torture young souls as they try to escape the madness that is Dark Harbor. 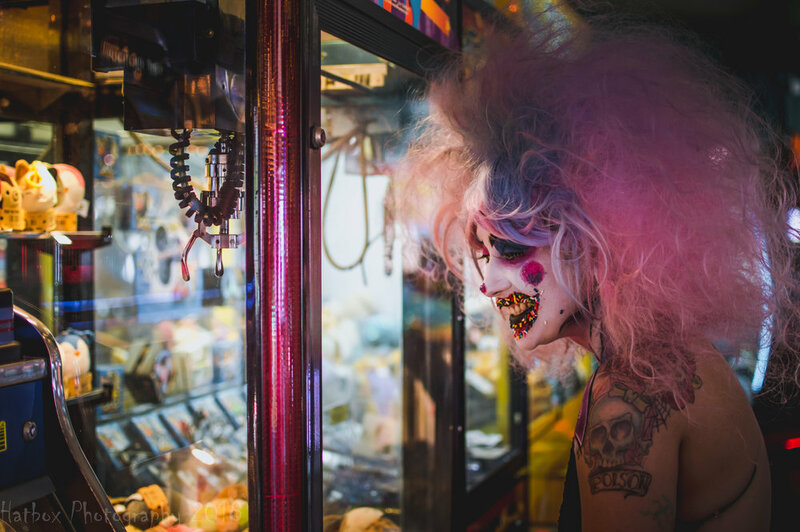 This year, will you be brave enough to step inside the gates and come face to face with Sprinkles the clown?